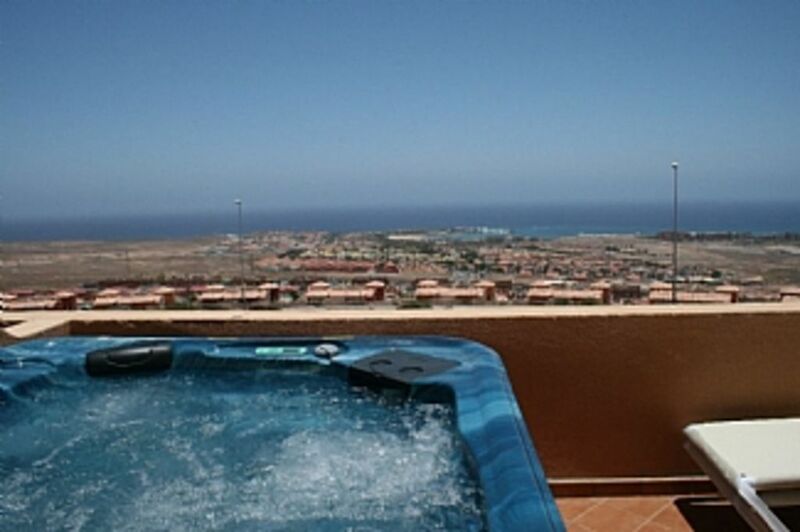 Holiday Home in Caleta de Fuste, Fuerteventura - Lovely Sea Views!! In a charming, quiet and peaceful location on Chipmunk Mountain, ideal for relaxing, but not too far from the night life. The private roof terrace offers wonderful captivating views of Caleta de Fuste town and the ocean. The property has FREE Wi-Fi and has a wide range of UK TV Channels. The property has its own private 5 seater Jacuzzi which will also allow you to enjoy the stunning views from the private ground terrace. Beautiful by day but also enchanting by night. It provides an excellent level of accommodation for couples, families and golfers looking for a relaxing, luxurious holiday in the sun. The property is situated in Caleta de Fuste, it is designed to sleep 4 comprising of comfortable and tasteful furnishings in a modern stylish setting. To encourage early bookings and new customers, our house is on special offer at only £336 per week, and £399 per week over Christmas and New Year. A £50.00 deposit is required with payment. This deposit is refundable dependent on the condition and contents of the property after your stay. We have everything which will ensure you have a PERFECT holiday! We are registered with the local authorities in Fuerteventura to be able to rent our property. We went on holiday to Caleta de Fuste at the beginning of 2011, after our amazing relaxed and chilled holiday we decided to buy a holiday home on Chipmunk Mountain on the outskirts of Caleta de Fuste. It took us a couple of months to find a holiday home in the correct location which would suit everyone’s requirements. The holiday homes location is quiet, relaxing, with stunning sea views, wonderful restaurants and beaches! Everything which would make your holiday the best! Whilst having a quiet location with stunning views, it is only a few minutes’ drive from the Town Centre, sandy safe beach, local shops and restaurants, shopping centre and PGA Golf course, giving you the best out of your holiday! Large family size bathroom Bath with overhead shower, washbasin, WC and bidet. Good sized modern living room, dining area for 4. Large comfortable sofa. Access to terrace area through secure patio doors where hot-tub and outside dining area can be found. Amazing views. Quality plasma TV and entertainment centre with DVD. Fuerteventura is now proud to own its first 18-hole golf course. There are 2 main Golf Courses in Caleta de Fuste, including 1 PGA Golf Course. Both of the main Golf courses are within a 5 minute drive from the property. Enjoy the amazing Sea views from the sunny roof terrace! Bel appartement bien placé pour rayonner à Fuerteventura. L adresse donnée était fausse. Ça commençait bien ! Trop de vis à vis avec les voisins. L appartement est loin du centre ville. Thank you for taking the time to review our Holiday Home, this is greatly appreciated. We are sorry that you felt the address was given wrongly to you and that the house was far from the centre. We give all of our guests as much information as possible, including the full address, a detailed map and directions to the property. Thank you for bringing this to our attention we will review the directions and the map again. Please could you let us know which part of the address you had a problem with. On all of our information we do state the property is up a hill and not in the town centre, as not all of our customers wish to be in the centre. We apologise that you found some issues with the appliances in the property, we will certainly look into this with immediate effect. We do have a property manager who lives nearby our property who is always on hand to assistance with any problems and I am sure she would have been happy to assist you with any of these issues if asked. We are sorry that you feel disappointed with your stay at Casa View, we do always strive to ensure that all our guests have a relaxing and enjoyable holiday. The marina is particularly pretty with a number of harbour front restaurants making wonderful places to sit and while away the time. We are able to recommend Local Food Restaurants and Supermarkets to you if you require. English Restaurants are available in Caleta de Fuste; information regarding these restaurants are available upon request. Are you interested in Mountain Biking? We are able to recommend bike hire facilities. We are able to recommend Diving Schools to you. If you are interested in any of the above activities please let us know once you have booked and we will send you information regarding any of the activities. There is always something to do in Caleta de Fuste. Do you have an activity which you are specifically interested in? Let us know and we will provide you with as much information as possible. There is a large clean and safe sandy beach which is a 5 minute drive away. Airport is 10 minutes drive away. Taxis to Airport are approx 15 Euros. A three to four minute drive or 25 minute stroll brings you to the main town of Caleta de Fuste. Caleta De Fuste is an easy 10 minute drive from Fuerteventura`s newly expanded airport. Caleta has lots of bars, shops and restaurants which are a 5 min drive away. Booking Notes: Please contact owner. Changeover Day: Please contact owner. Notes on prices: If you require less that a week please call or email for prices and availability. There are no hidden costs. To get even better value for money on last minute deals , please make us an offer! Enter details of your offer in the message box in the send email to owner section.